A few days ago I arrived at the Imperial Dam, LTVA. In BLM (Bureau of Land Management) parlance, LTVA means Long Term Visitor Area. Technically, being on the western side of the Colorado River–or rather what is left of it this far south–the LTVA is in California. On the eastern side of the river is Arizona. 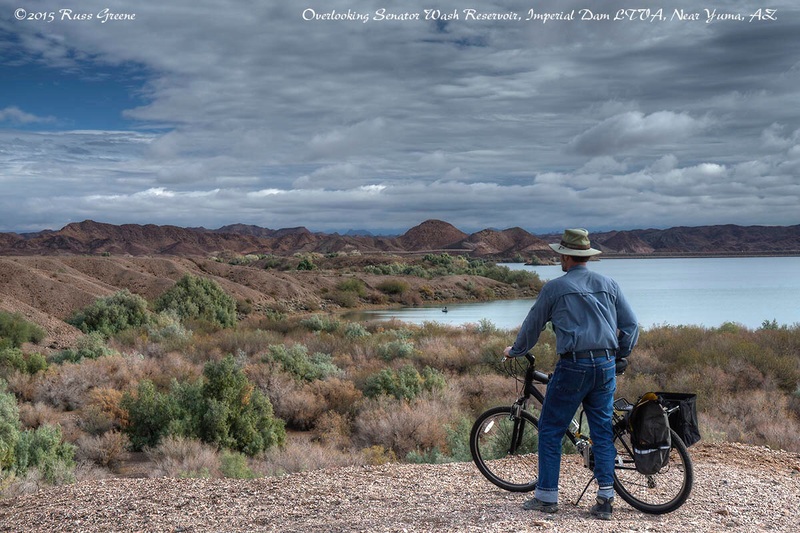 Nevertheless, it seems the Imperial Dam LTVA is often regarded as being in Yuma, perhaps because Yuma is the closest city and the LTVA is overseen by the Yuma BLM office. Recently I was at another LTVA up in Quartzsite, AZ, so I expected the Imperial Dam area to be similar. In ways it is–lots of RVs spread out over a large area of desert, but it seems different here. How? Well, when I was in Quartzsite it was the time of the big, annual RV show and lots of people were in town just for that. Even before the 10 day show had run its course the crowd of RVs nearby had begun to thin. It was a place where a large portion of RVers had shown up for a short spell. Here, I get the feeling that a greater percentage of campers show up for the season, or a large part of it. The season begins September 15 and runs through April 15, some seven months. Unlike Quartzsite I am finding a sense of community here. People seem to know each other, or at least know of each other. Encampments often have a more lived-in, long-term feel as evidenced by clotheslines and auxiliary structures such as temporary sheds and greenhouses. It appears many campers come for stays of several months or more and have been coming here for a number of years during the season. There are a couple bulletin boards with for sale and wanted signs posted, as well as a list of community activities such as hikes, music jam sessions, parties, potlucks, Karaoke, yoga and aerobics classes. There is even a “liberry”. None of these things are sponsored or sanctioned by any official body such as the BLM. They all happen as a result of the people camped here. All this has taken me by surprise, caught me off guard, and I think it’s pretty darn cool. Speaking of cool, it’s also pretty darn warm. Regular readers of this blog know that my escapades have seen me chased south by cold weather all the way from Minnesota to New Orleans and that I didn’t escape it even in southernmost Texas where I awoke one morning to find an icicle some 18″ long hanging off my RV. Finally, I’ve found a place where it will be warmer, even hot, with predicted temps in the area of 90º in the near future. Out of the freezer, into the frying pan… whaddayuh goin’ tuh do? Well, what I’m goin’ tuh do is to chill (maybe I should say “warm”) here for maybe as long as a month, to finally sit still in one place long enough to relax for a while, catch up on my blogging, and get some RV repairs and mods handled… you know, just chill… umm, err, warm?!? Part Five: Katy Perry Live at the LTVA?